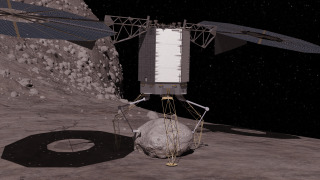 In this concept image, the robotic vehicle descends to the surface of a large asteroid to collect a boulder that it can redirect to a distant retrograde lunar orbit. NASA's bold plan to park an asteroid near the moon may also test out a new way to protect Earth from dangerous space rocks. Last year, the agency announced that it intends to tow a near-Earth asteroid into a stable lunar orbit, where it could be visited repeatedly by astronauts for research and exploration purposes. NASA officials are still ironing out the details of the mission, which may bag up an entire small space rock or snag a boulder off the surface of a large asteroid. Given enough lead time, asteroids on a collision course with Earth can be safely deflected using a handful of methods. One of these is the gravity tractor technique, in which a robotic probe flies alongside a space rock for months or years, gradually nudging it off course via a slight gravitational tug. The greater the shepherding probe's mass, the stronger its gravitational pull is. And poaching a boulder off a potentially hazardous asteroid would allow a deflection mission to increase its mass significantly without having to pay any additional launch costs. "We'd go into this enhanced gravity tractor position after we retrieve the boulder and demonstrate that we have even more gravity attraction capability by doing that," Lindley Johnson, program executive for NASA's Near-Earth Object (NEO) observations program, told reporters in March. NASA has identified about a dozen promising candidates for the asteroid-capture mission, Johnson added — six or so for each of the two options. The best target for the boulder-grab mission may be Itokawa, a 1,750-foot-long (530 meters) space rock that was visited by Japan's Hayabusa probe in 2005. The space agency wants astronauts to visit the redirected asteroid by 2025, to meet an exploration deadline set by the White House. In 2010, President Barack Obama directed NASA to get people to a near-Earth asteroid by 2025 and then on to the vicinity of Mars by the mid-2030s. The asteroid-capture mission remains in a "preformulation" phase at the moment, as NASA is still gathering data and sorting through ideas. The space agency hopes to have a basic mission concept in place by around the end of the year, officials have said. More extreme measures might be necessary for extremely large asteroids and space rocks detected with little warning time. In such cases, a nuclear bomb might be humanity's best — and perhaps only — option.